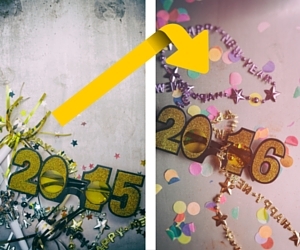 Enter Pictures and Events Once... Print Beautiful Custom Calendars for Years to Come! May 2015: I'm sorry to announce that the creator of Family Picture Calendar has decided to discontinue this software program. Family Picture Calendar is a program that makes it easy for anyone to create a customized, professional, printable family calendar that can be hung on your wall, used as desktop background and/or sent to all your family members via e-mail month by month, year after year! 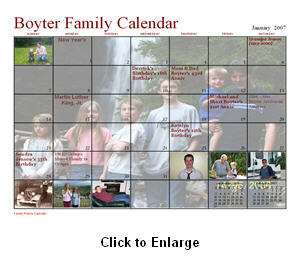 This printable family calendar software was created by Mr. Doug East in Colorado. Before I found Family Picture Calendar I had been searching for a way to create a printable family calendar that would help families share common family history, tradition and heritage. The key criteria was that it had to be one where I could include not only multiple pictures but family facts and information. I had long been impressed with historical calendars and sports team calendars where nearly each day on the calendar had some sort of fact or bit of information included about that day in the history of that sports team. For example one day in the month of April may say, "On this date in 1981, the Dallas Cowboys drafted such and such a player". Why couldn't this concept be used for families? "Grandma Jones was born on this date in 1938"
"Floyd and Sarah celebrate their 20th wedding anniversary on this date". "Just think of all that could be included in a custom made calendar like this! I found Family Picture Calendar. I bought a copy and began entering tons of information about my own family and extended family -- cousins, siblings etc. I couldn't wait to send each of them a copy of my finished yearly calendar. I, of course, included birth dates and anniversaries of my parents, siblings and extended family. Don't worry, though, about revealing the ages of those who would "kill" you if you did! Click Here to Download a Free Version of Family Picture Calendar! One of my grandmothers passed away in 1984. It is rare that I don't think of her, especially each year in May, as her birth date comes and goes. Besides my mom, how often does the rest of the family think about her? Hard to be sure, especially when the day comes and goes and she hardly comes up in conversation. This has always saddened me. This is one of the key features that I liked about Family Picture Calendar. With it you can enter the birth dates of anyone to include family members that have passed on. What better way to remember and celebrate their lives and contributions to the family than including them each year on the family calendar? It can also help us share our family history with our children. When a child see a great grandparent's name or picture on a particular month of the calendar, they become curious. What follows is a perfect opportunity to share with your child all that you know about that departed, but not forgotten, family member. Kids today don't know much about those who only came a generation or two before them! We should work to fix that, don't you think? If you really want to have a great family calendar, dig out some of your genealogy and look for important dates to include from those records! In the end I had a calendar jammed-packed with my family's history and meaningful events - from the 1800s to the present day!. Once this information was input into Family Picture Calendar it carried forward to the next years calendar... so I didn't have to keep re-entering the data. . I went looking for old pictures to scan and include with the monthly calendars. How could I resist including that picture of my sister's bad perm picture from years back? She still "hates" me for it! An "Official" Family Calendar ... does your family have one? Perhaps it is time to start yours. Families today are highly mobile and spread-out all over the country....and world! A calendar, like this, can go a long ways to keep your family connected, despite the miles ... kilometers etc! Your family calendar should include the date by date, historical happenings and modern events in your family's history...and the past events accumulate year after year. 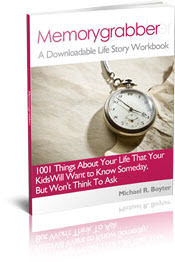 "...1971, Richard and Karen were married"
...Or Quickly Download a Trial Version Now!